Xiaoling created a low table centrepiece based in a piece of gum to be placed on the beautiful timber dining table made by her carpenter husband. Her parallel design is beautifully executed with very good movement. It looks good from a distance and invites you to look at it more closely, revealing still more. Her well chosen materials include waratahs, banksias and kangaroo paws to create a unified monochromatic design in shades of red, with contrasting green provided by waratah leaves and spear grass. Xiaoling placed the spear grass first and then grouped the flowers. Her base work is good and she has used red rocks and sand to cover her mechanics and add weight to the base, while also supporting the monochromatic colour scheme. She has applied the Fibonacci theory in her design, applying the numbers 8, 5 and 3 to the flower groupings and also their relative heights. Mary aimed for simplicity and harmony with her lovely naturalistic parallel design. Her choice of materials links back to her mother’s childhood near King’s Park, Perth where family walks in the bush allowed enjoyment of the many beautiful wildflowers growing there. 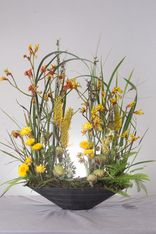 Mary has used an analogous colour scheme of cream (flannel flowers and grevilleas), yellow (paper daisies and kangaroo paws), orange, tan, lime (dryandra, juncus, dianella and umbrella fern) and dark green (lomandra leaves), placing the flowers and foliage ‘as they grow in nature’. Her modern arrangement consists of two vertical groups with negative space between them, symbolizing a meandering path to create a restful space and draw the viewer from the busyness of the two asymmetrical placements on either side. She has used grouping, but also clustering, mirroring and sequencing. Mary also applied the Fibonacci theory in her design, applying the numbers 8, 5, 3 and 1 to her flower groupings. Carmel’s beautifully constructed hand tied bouquet features lovely muted tones and was inspired by the small Victorian town in the bush that her grandfather comes from. She aimed to use flowers mostly from this part of Victoria, choosing to feature banksias because an old twisted banksia tree is believed to be a storehouse of old wisdom, like grandfathers. In a bouquet structured with a spiral, Carmel has grouped flowers together to take the eye easily through the arrangement. Yellow and green tones were added to represent the Australian ‘true blue’ and laid back culture of her grandfather.